This mod is based on the original Supra model by Siim Annuk (Some1). 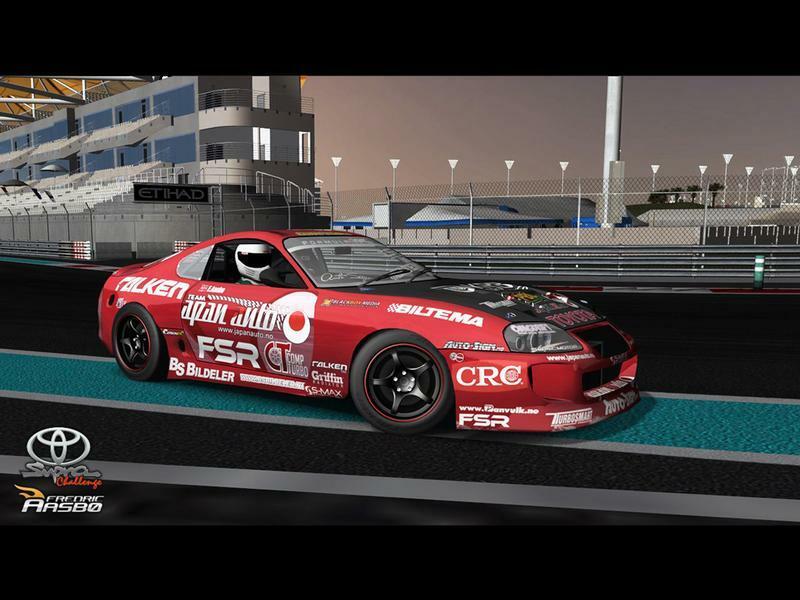 The mesh has been modified and reworked by yours truly to accurately represent the battered and beaten Toyota Supra, driven hard by Fredric "The Hammer" Aasbø in the 2010 Formula Drift season. This famous Supra, nicknamed "Chucky" due to it's many battlescars, has been described by Formula Drift announcer Jarod DeAnda as being "held together with zip-ties, bubble gum and the hopes and dreams of Norway". My goal for this project was to create a drifting experience as close to the real thing as possible. A car that drives like a regular car, and doesn't float all over the place. And I think we are close. Thanks to Niels and hours of testing, I now feel that I have a car that can go fast around the Nordschleife as well as pull backwards entries. It's still not 100% perfect, but then again, neither is the real "Chucky". A big thanks goes out to everyone who has been involved in creating this mod. A special thanks to Fredric Aasbø himself for valuable feedback and information regarding setup and physics. Hello! Thanks for trying the Supra Drift Car! I did this project because it is fun, and to show that rFactor is pretty capable of doing extreme sliding despite people often claiming you can't drift with it. I have simply tried to make a very powerfull, front engined rear drive car, with plenty of steering lock. Nothing was done to make it drift, unlike most drift mods which feature unrealistic tires and inertias (etc). - Higher framerate is better, you can't have enough! - Start rFconfig.exe, turn Vsync OFF! - This reduces latency, though if you have the wrong type of screen / tv, you might still be in trouble.. I really hope you enjoy the mod, and don't hesitate to leave feedback or ask us questions. This will always be a work in progress, and there's still a lot of stuff to improve! 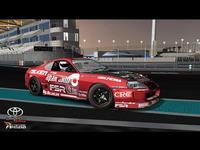 There are currently no setups for Fredric Aasbo Toyota Supra MKIV Drift. Add a Setup. In a effort to promote F1-like road racing in America. The SCCA came up with an equivalency formula. Formula 5000 was an international single-seater formula that was created by the Sports Car Club of America. i ave installed this mod but it says it cant load texture RIM2 and therefore there is no car on my screen it's just blank, any help with this? i have rfactor 1.255 the mod does work ... atleast a part of it... it just doesn't load the textures.. i have no picture of the car it's just a box with wheels but it does drive perfectly ... any sudgestions what 8i should do ? Maybe an update to 1.255? Good mod, plenty of fun to be had with it. Just dropping by to say that this is the easiest out of the box drift mod that I have tried. Thanks for your hard work that has gone into this. Only thing I changed in the setup was to reduce tyre pressures and spring loads to reduce the understeer, but that's only because I'm not used to the car yet! I've noticed that you have to force the car into a slide with the hand brake (just like the real thing) rather than steering into a corner and then power on. Overall really good mod because I could never ever drift in rFactor no matter which drift mod, could be just me not knowing how to set the car up. This mod is great, you can easliy get into it with the standard setup. No worries, it's just that I don't want people to get the feeling that we've just thrown random numbers in there, when in fact most of the "unreal" values are very real indeed. There might be some minor miscalculations in non important areas, but overall I'd say this is one of the most detailed and accurate cars out there. It's not like a stock Supra, nor a generic drift car. It's a purpose built, real life drift machine. The stuff that feels wrong in rFactor is actually "wrong" in real life too, but it's all like that for a reason.